Launched only two weeks ago – and already available in stores – the Premier is the second all-new line of watches (after the Navitimer 8) launched by chief executive Georges Kern. But more importantly, the Premier encapsulates Mr Kern’s strategy for the brand, both in form and substance. Described as “modern retro” by Mr Kern, the Premier is loosely inspired by its namesake original of the 1940s, intended to be a versatile watch in between a bona fide sports watch and a no-frills dress watch, and it succeeds in that respect. The styling is handsome, with enough details in its construction to make it interesting, but the Premier plays its safe visually. 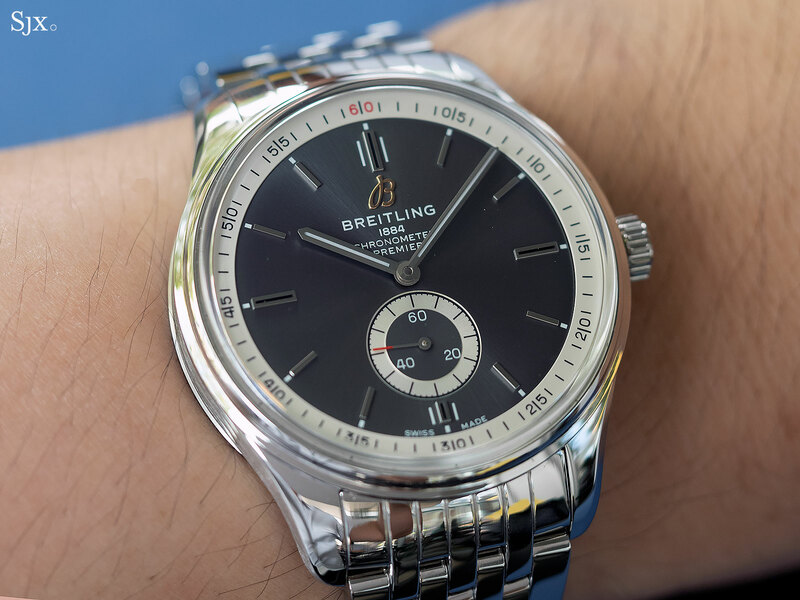 It’ll neither raises eyebrows nor pulses, but instead sticks to Mr Kern’s goal of a good looking watch that is easy to wear, made desirable by strong marketing (which is why Brad Pitt and Charlize Theron are now part of the Breitling “squad”). Comfortably retro without being old fashioned, the dials all have baton indices and hands. But they avoid looking flat thanks to a sloping flange for the minute track, along with the indices and logo being metal appliqués. Notably, the hour markers at each quarter are flanked by printed batons, which lend a vague Art Deco feel, especially on the base models. 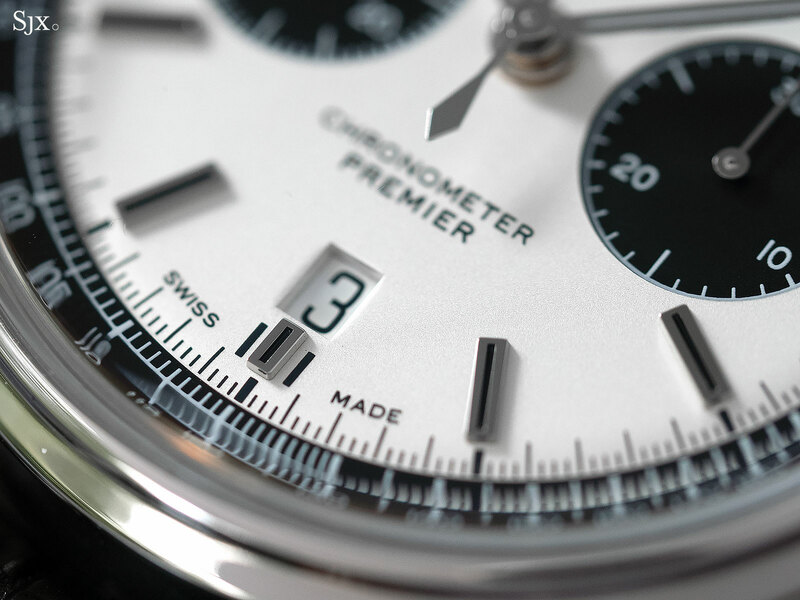 All of the Premier watches have metallic finish dials with radial brushing, except for the Premier B01 “panda” chronograph. 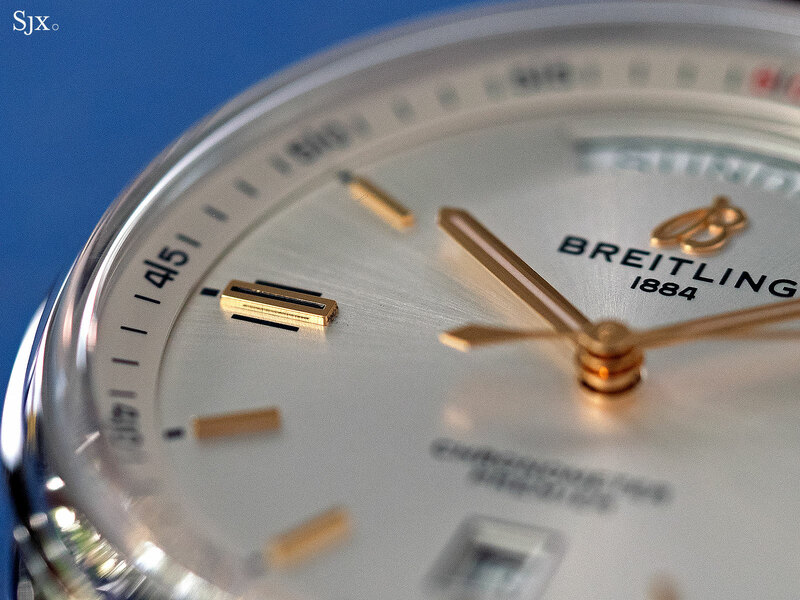 Its dial has a finely grained surface that suits the vintage styling. It’s challenging to make a round watch case even moderately interesting, but here Breitling succeeds. Like the dial the case possesses a light touch of Art Deco with deeply engraved fluting on its flanks. But it’s also well detailed on the lugs, which have a wide, polished bevel that contrasts with the brushed sides. And the attractiveness of its profile is further boosted by the domed, “box type” sapphire crystal. 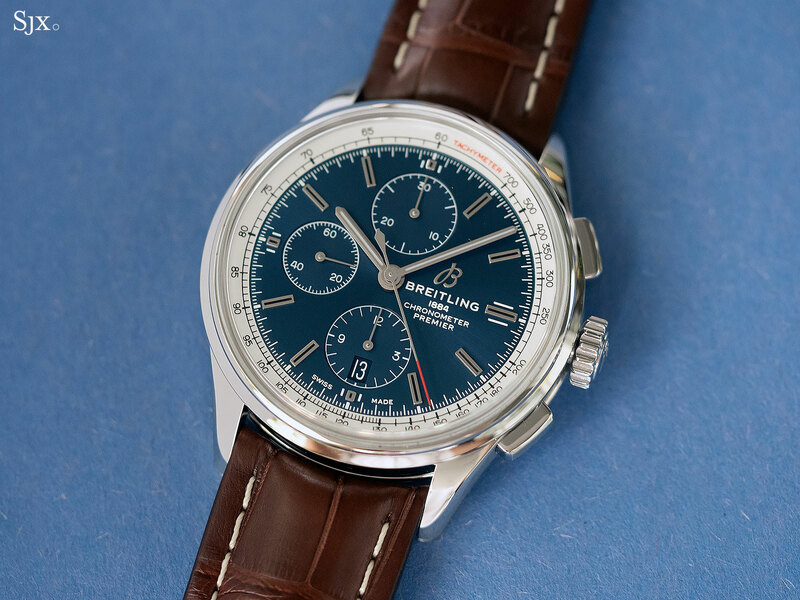 The refinements on the case are all the more pronounced when compared with the immediate past generation of Breitling cases, which tended to favour large, flat surfaces entirely that were wholly mirror polished, a characteristic Mr Kern has declared is a thing of the past. 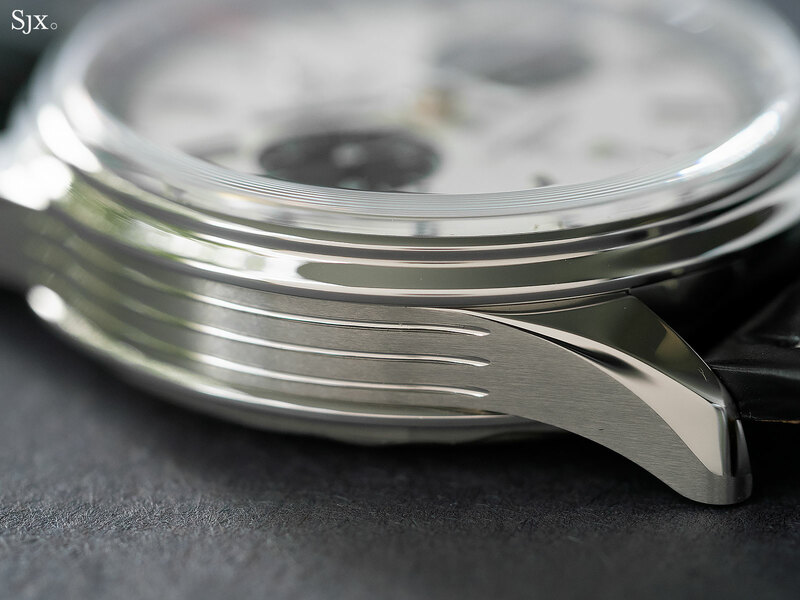 As Mr Kern once did at IWC, the detailing of the crucial components like the dial and case have been improved, while the less vital bits are simplified. The case back is fuss-free, while the folding clasp is of the type that works on ordinary straps (unlike the earlier generation that required a specific strap type). 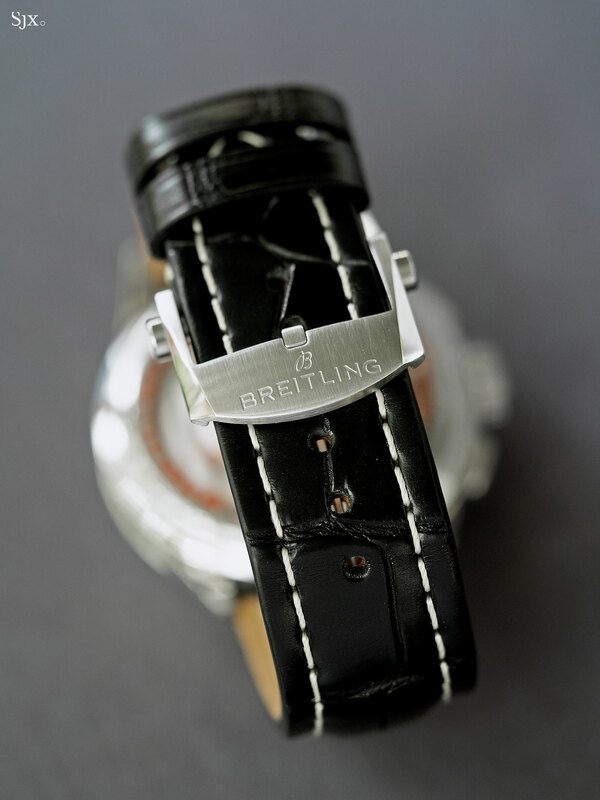 And while the earlier generation of Breitling leather straps were surprisingly high quality for the type of watch, the straps on the Breitling are just good enough. 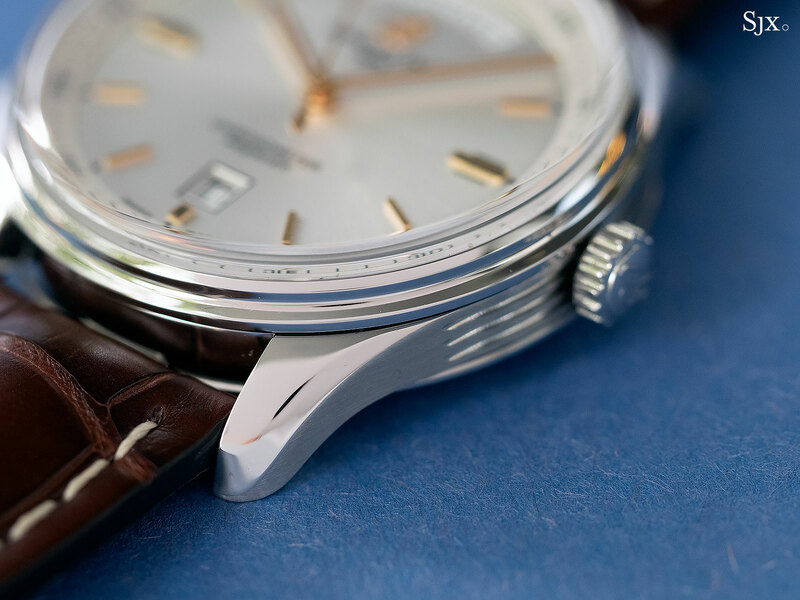 The Premier is also available on a newly designed bracelet that’s based on Breitling’s trademark slanted-link Pilot, but now made thinner with narrower links, giving it a slightly more refined look. 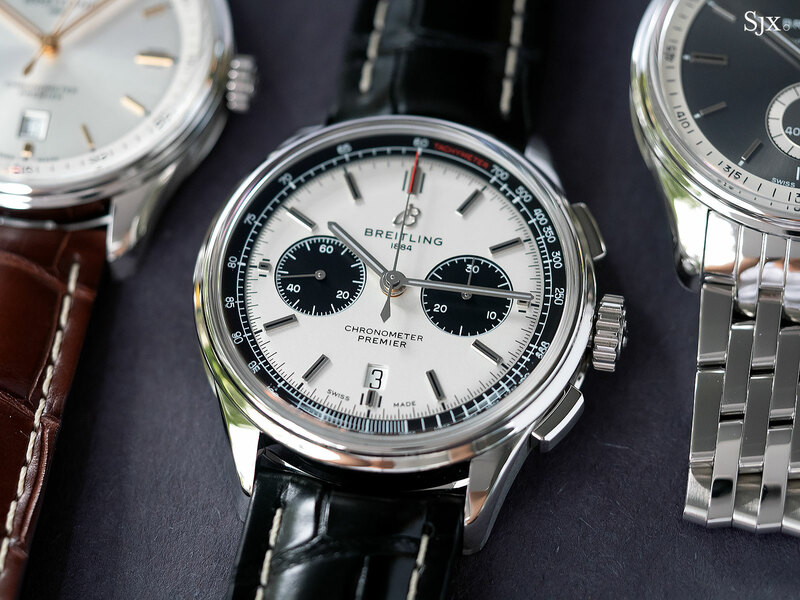 As is the case with Breitling’s other lines, the flagship Premier B01 Chronograph 42 is powered by the B01 movement. 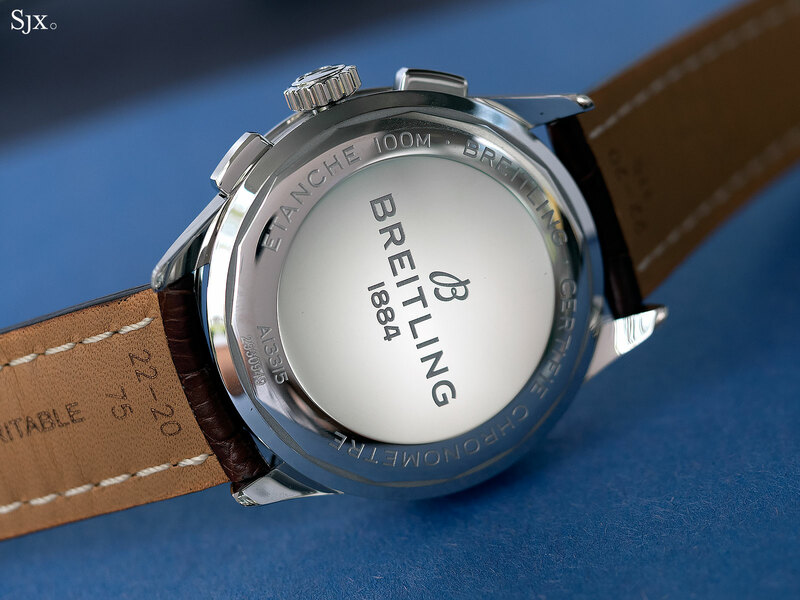 Because of that, the Premier B01 is the only watch in the range with a display back. 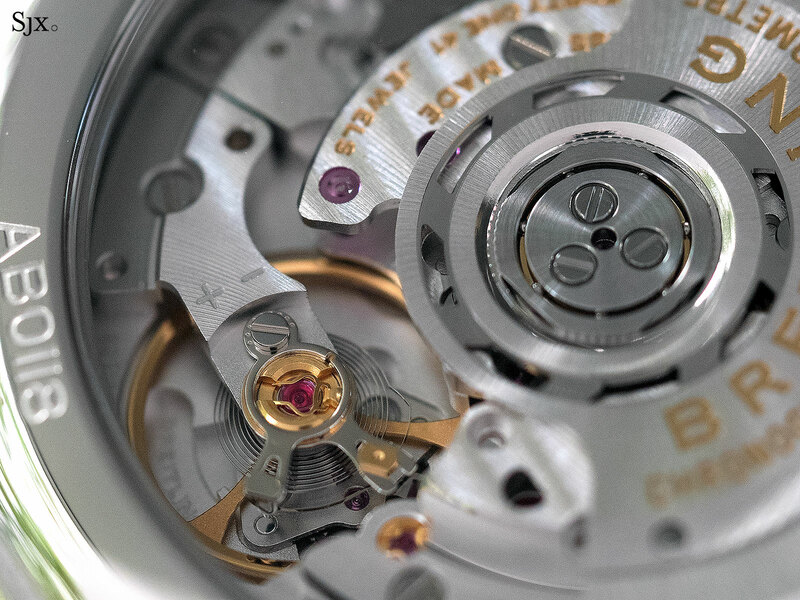 The movement is finished simply and by machine, but to a degree that is typical of a watch at this price point. More importantly, the B01 is one of the better constructed movements in a chronograph below US$10,000. 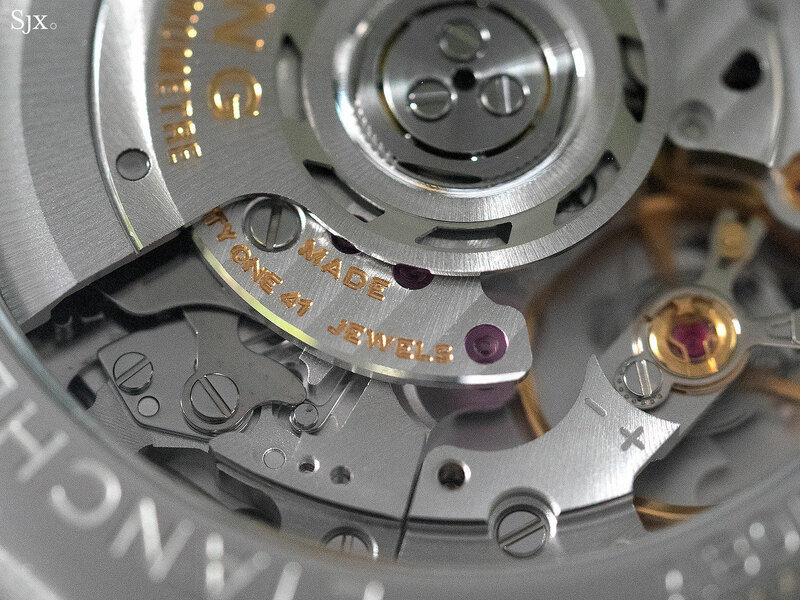 Developed and made in-house by Breitling, the B01 is a robust and well designed movement that has all the features of a modern, mid- to high-end chronograph movement, namely a column wheel and vertical clutch, as well as a longish 70-hour power reserve. And the B01 also boasts an instantaneously jumping minute counter, which means the elapsed minute hand moves in a single, discreet step from one minute to the next. While it makes little difference functionally, the instantaneous minute register has lots of visual and intellectual appealing, and it is also not a common feature in chronographs – the first wristwatch to have it was the Lange Datograph. The finishing of the B01 is well detailed, but done by machine, as is par for the course at this price point. 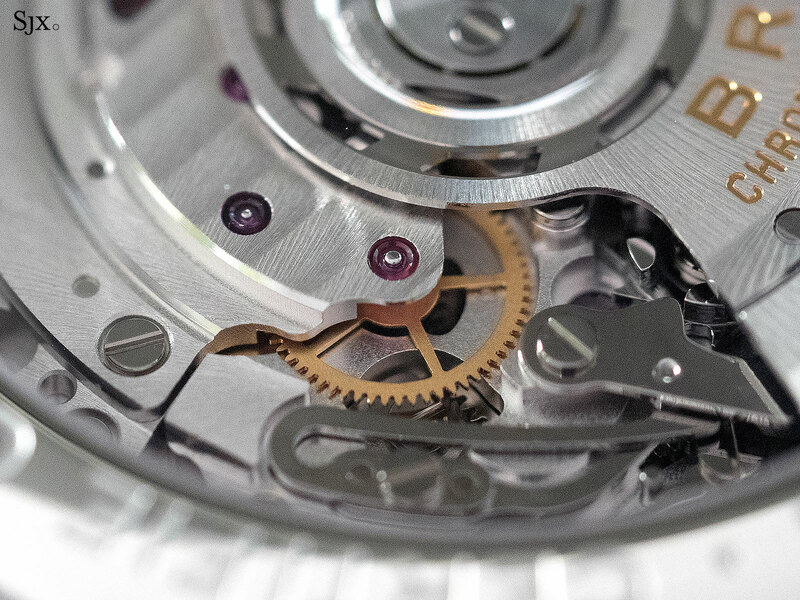 The rotor, bridges and base plate are rhodium-plated, but given different surface finishing, ranging from Cotes de Geneve to circular graining, creating a good deal of visual appeal. The B01 is slightly thick at 7.2mm high, compared to say the 6.5mm high cal. 4130 in the Rolex Daytona, but not overly so. As a result the case is a tall one. The Premier B01 is 42mm wide, a moderate size by modern standards, and 13.65mm high. 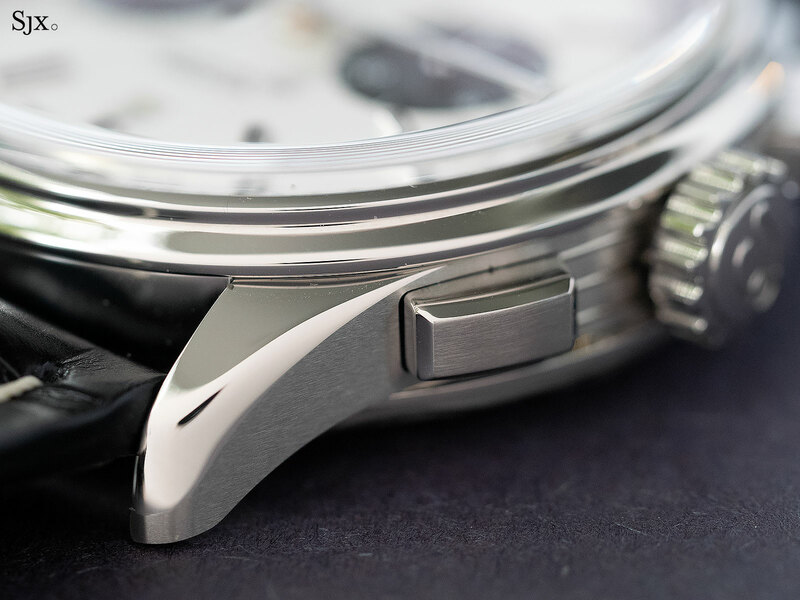 Though the watch case is thick, its vertical profile is helpfully broken up by the detailing on the case sides. But numbers aside the proportions of the case work well with the movement and design. 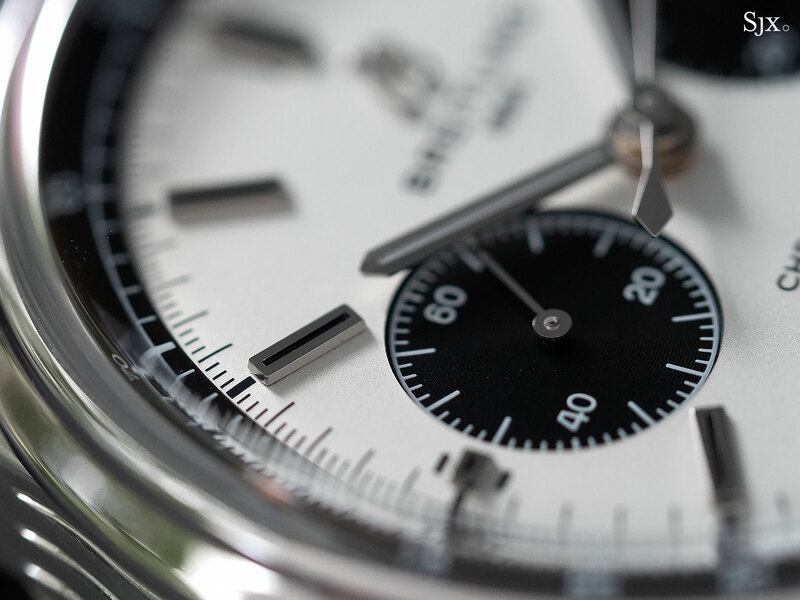 Both chronograph sub-dials sit an appropriate distance away from the centre of the dial, avoid the cross-eyed look of many chronographs that combines large cases with small movements. 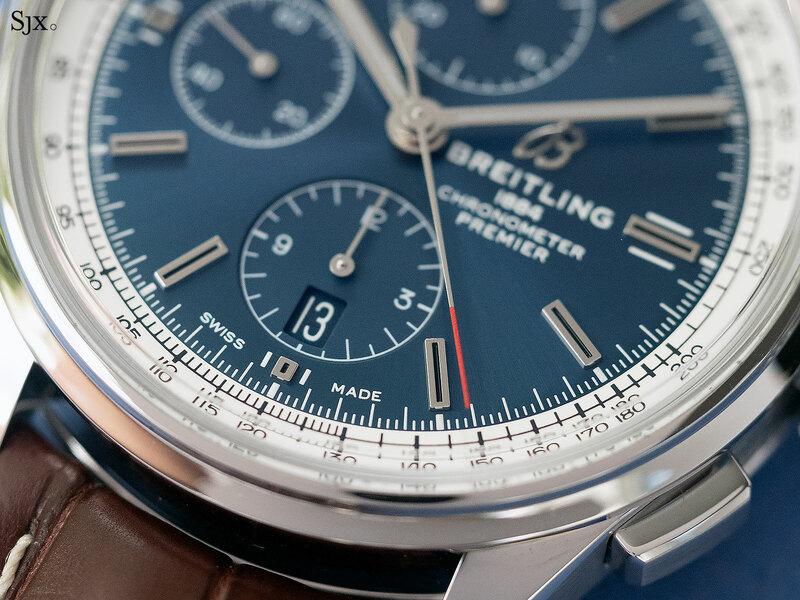 All of the Premier B01 watches have contrast colour sub-dials, now a standard feature across all Breitling watches to set apart watches with its in-house movement. 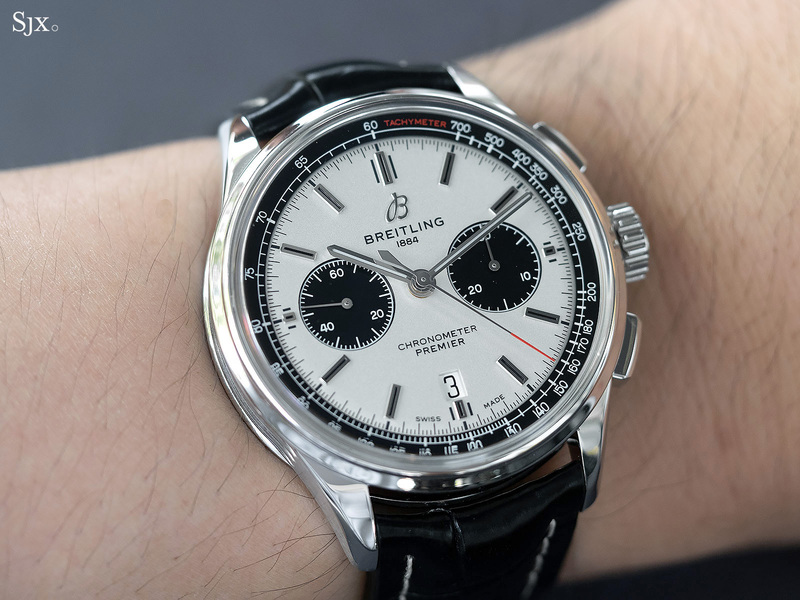 The Breitling Premier Chronograph 42 is almost a quarter less expensive, because it is powered by the low-cost Valjoux 7750 movement made by ETA. 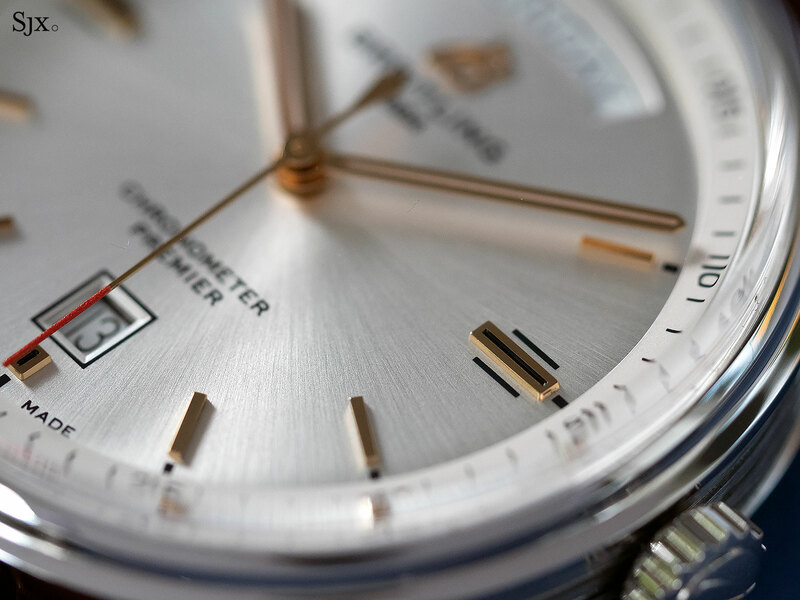 That gives it the recognisable “6-9-12” sub-dial layout, which is less visually appealing than the “bi-compax” layout of the Premier B01. 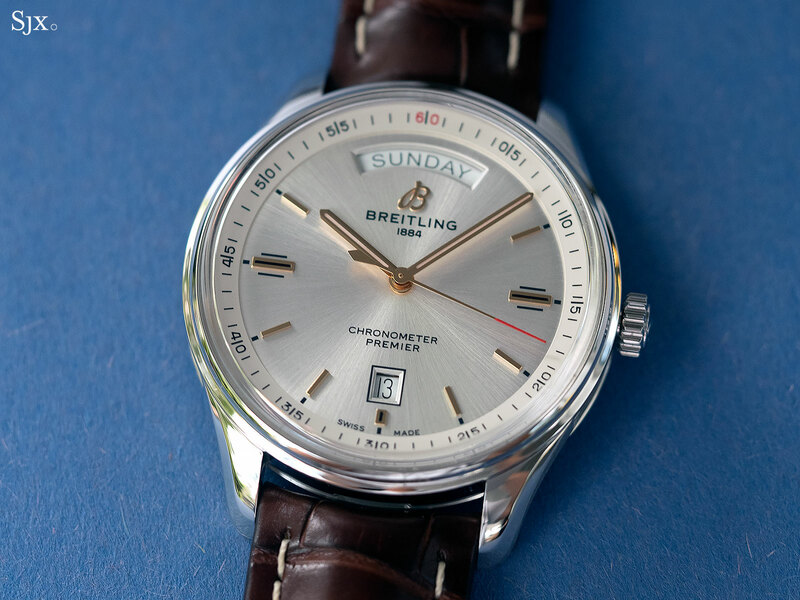 Size-wise it is identical to the pricer Premier B01, having the same diameter and a height of 13.8mm, so its tangible feel on the wrist is identical. Considering the price and specs, the Premier B01 is probably worth the stretch relative to the 7750-powered Premier. The other two watches are entry-level automatics. The first is the Premier Automatic Day & Date 40, a straightforward watch that does what it does quite well. It’s 40mm by 11.4mm, which is an eminently manageable size. 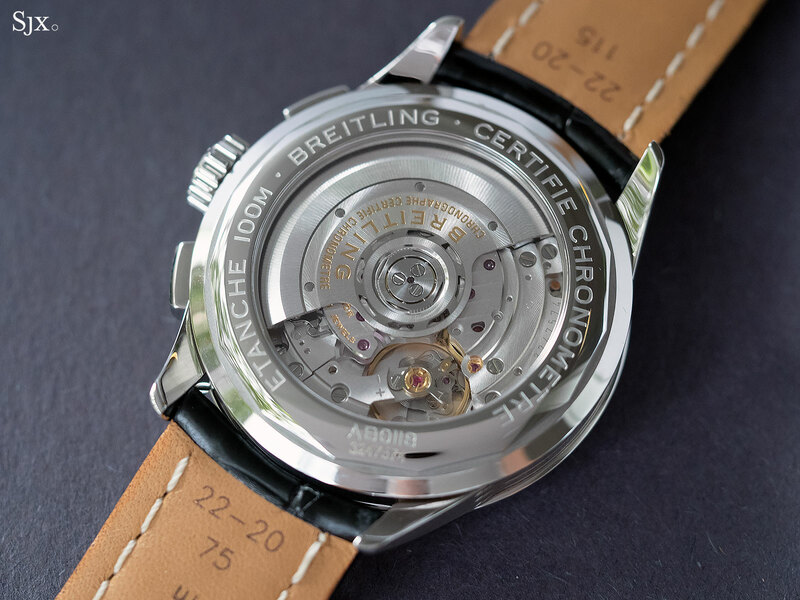 And it is relatively affordable thanks to the ETA 2824 based movement inside, renamed the Breitling 45. 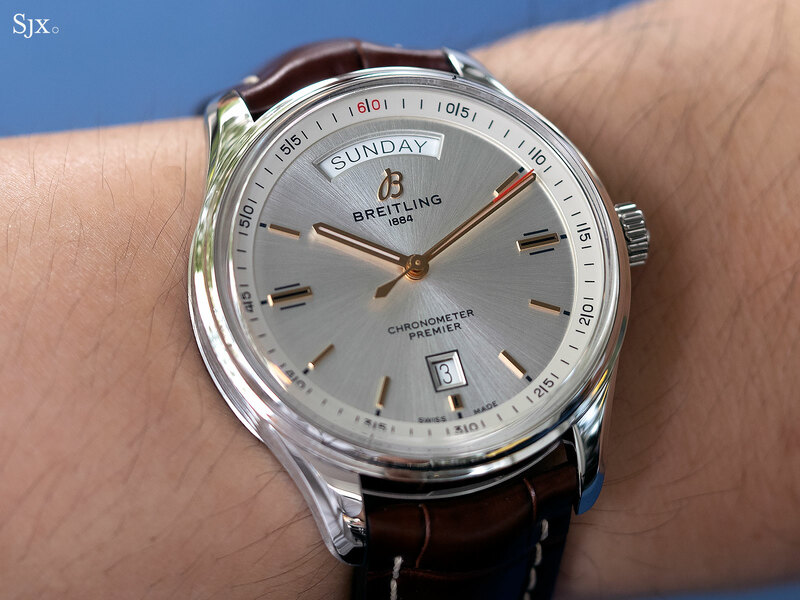 Interestingly, the Premier Day & Date is the only model in the line-up with rose gold-plated indices and hands, which might be a tweak to make it more palatable for the East Asian market, where day-date watches are fairly popular. 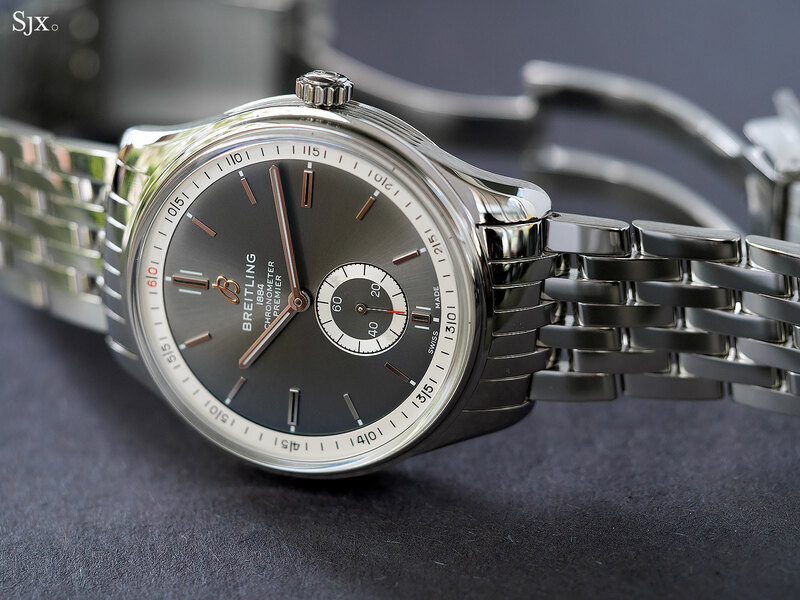 Identically sized and priced but reduced to the minimum is the Premier Automatic 40, a watch that will no doubt appeal to traditionalists who want a time-only watch. 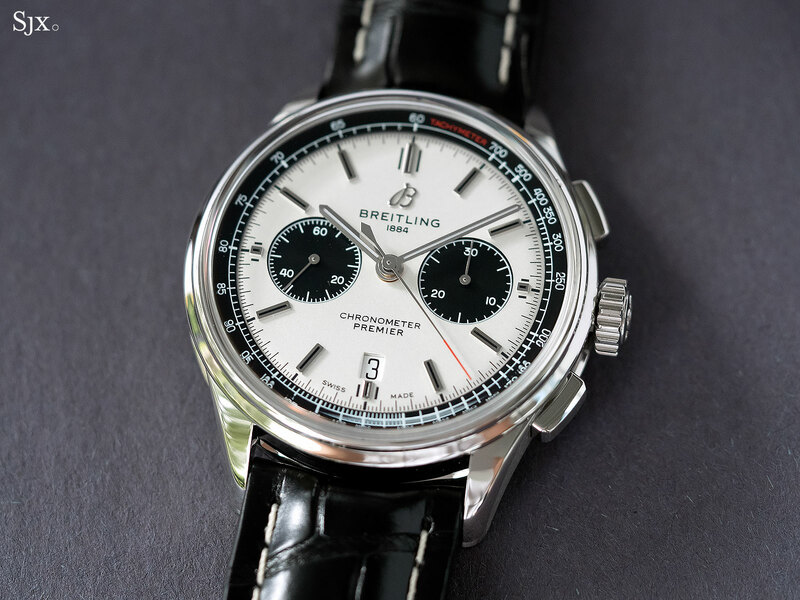 This is also powered by a variant of the ETA 2824, here christened the Breitling 37. On a leather strap this feels almost like a vintage remake. 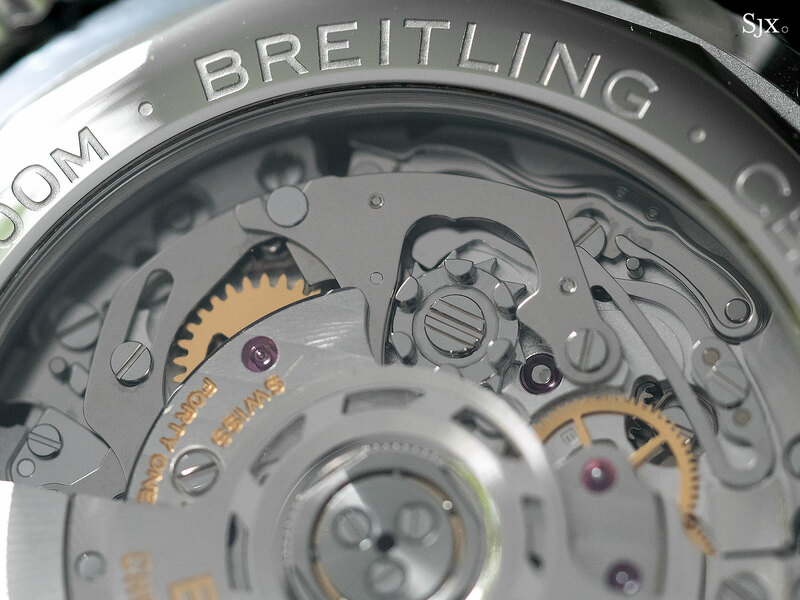 The Premier collection is already available at Breitling boutiques and retailers. Steel bracelets and crocodile straps cost extra.